i added an email subscription box to the bottom of the sidebar a couple of weeks ago; if you’re interested in getting an email once a week when a new post goes live, sign up! as much as i love baking and cooking, i barely cooked last week. flying back to school, starting classes, being semi–social, increasing my youtube consumption and doing some heavy lifting for a club i’m a board member for has been intense. i got out of a 90 minute lecture on the history of computers (it’s a human-computer interaction class, which should hopefully move beyond the ramifications of how little memory computers used to have) just wanting a nap and chocolate. let’s go back to more exciting days cooking wise, back when i made this miso pilaf with cucumber and grilled eggplant. normally the smell of cooking quinoa is a little weird; i find it cozy, though then again, i’m the person who still has a jar of very garlicky, very tangy, and very pungently scented pickled daikon in the fridge back home. that no one else dares touch or sample or smell. but here, the quinoa really smells good. the cooking miso, ginger and garlic takes on an almost sweet, very rich scent that you’ll have to experience on your own. this miso pilaf with cucumber and grilled eggplant is rich and savory from the miso and quinoa, but there’s also mint and cucumber to keep it fresh. the eggplant stays tender, and the cucumber gives a good crunch. a variety of flavors and textures to keep your palate happy enough to devour a bowlful, though you could easily jazz it up more with toasted nuts/seeds, tomatoes, etc. Drizzle the eggplant with oil. Grill or saute them cut side down until lightly charred and tender, about 7 to 8 minutes. Flip and grill skin side down for 2 to 3 minutes more. The eggplant flesh should yield easily when poked with a knife. Cool slightly. Slice the eggplant crosswise into half moons. 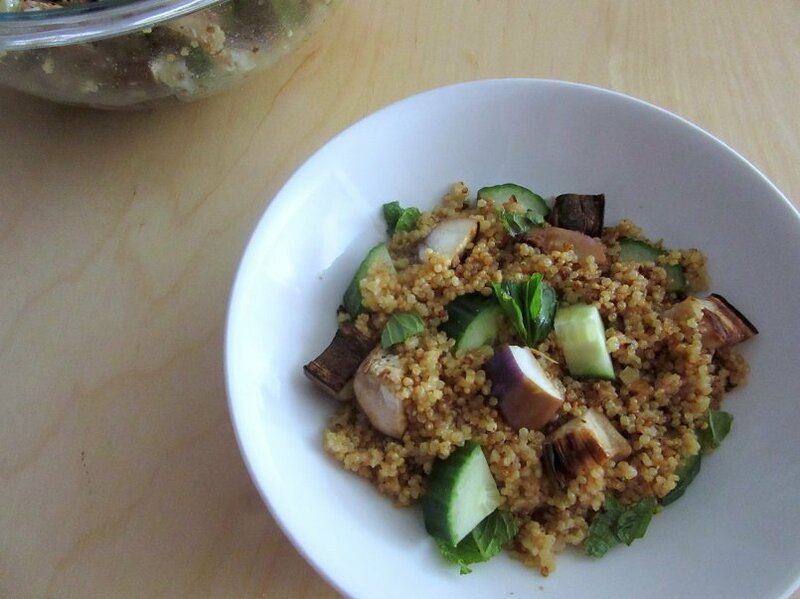 Combine the butter, quinoa, milk, miso, garlic, ginger and 1 cup water in a rice cooker. Cook, stirring occasionally to make sure the garlic and ginger don’t burn, until tender. You could do this stovetop, but why? Fluff quinoa and transfer to a large bowl. 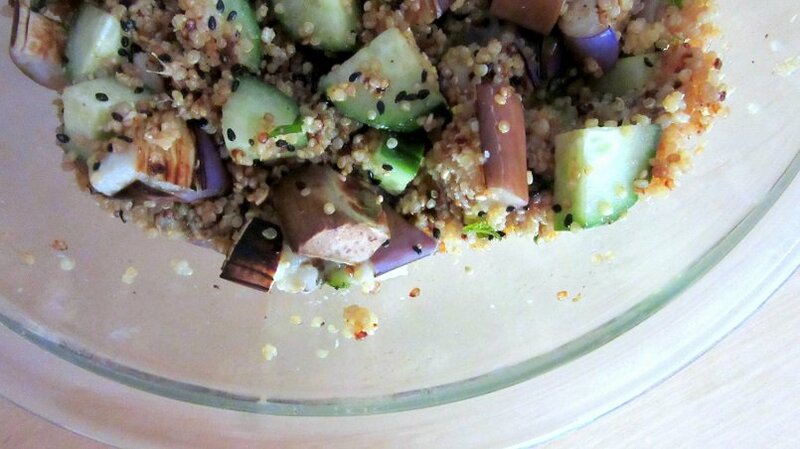 Add the cucumber and eggplant. Combine the sesame oil, fish sauce and balsamic vinegar, then add to the pilaf. You can make more dressing if you want, but I don’t find it necessary since the pilaf is so flavorful already. Sprinkle with the cilantro and sesame seeds. Serve warm, at room temperature or cold. This is interesting, and i bet it was delicious too!